Apple shuts down iAd platform, taking iTunes Radio with it | What Hi-Fi? Apple has sent an email to listeners of iTunes Radio, stating that it is stopping the iAd platform at the end of January - which means iTunes Radio is going as well. 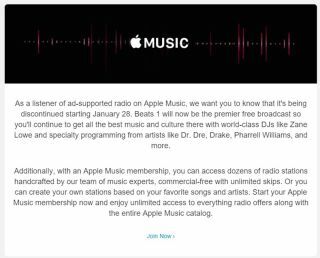 iTunes Radio is available only in the United States and Australia, so this news won’t affect Apple users in the UK. But for those who did use the service, Apple has stated that Beats 1 Radio, which launched alongside Apple Music, is available to listen to free of charge. Curated playlists and catch-up shows will require an Apple Music subscription. The news also means people who listen to radio stations ad-free through an iTunes Match account will no longer be able to do so. Customers in Australia have been told the service will end on 29th January, while in the US it will end on 28th January. The iAd platform, which lets developers embed interactive adverts within their applications, will shut down on 30th June. Mac Rumours says there will likely be additional changes to products and services as the iAd platform is revamped.